You'd think that with the proximity, Singapore would have many Indonesian restaurants, and good ones at that. Sadly, we don't. Really good Indonesian cuisine requires a lot of effort and time, so this probably makes it a difficult business. But one restaurant has come on the scene with great promise. 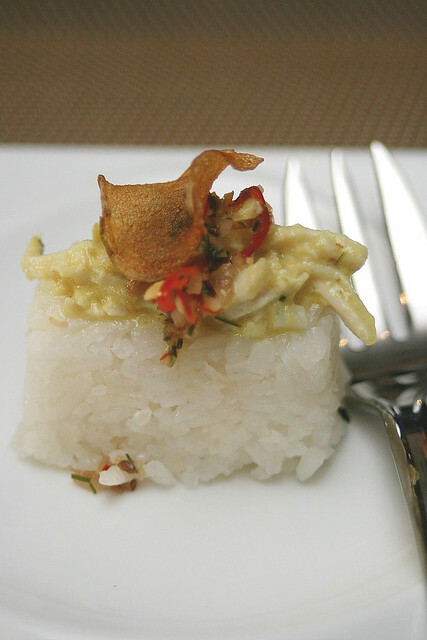 The Moluccas Room elevates Indonesian cuisine to a new fine-dining high. It's one of the waterfront dining outlets at Marina Bay Sands, which means it has a gorgeous view of the Singapore skyline. But it's the food you will come here for. 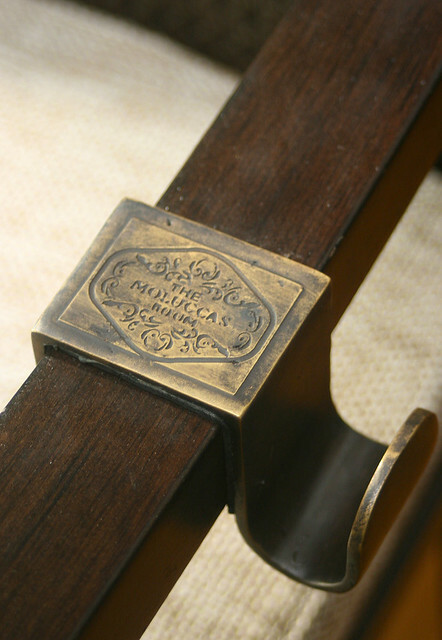 "Moluccas" is the former name of Maluku, famed in history for its abundant spices. Plenty of spices are used in this kitchen indeed, but the cuisine featured is from all across Indonesia, not just one region. 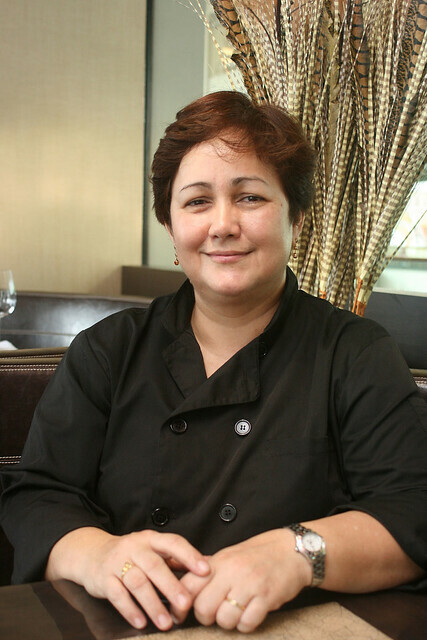 Chef Alicia Tivey is Australian but she had an Indonesian mother, and grew up loving the kitchen. She always knew she wanted to be a chef. Alicia also trained with Tetsuya Wakuda in the 1990s. Here at The Moluccas Room, she combines her knowledge of classic French cuisine with the Indonesian food that she learned in early life. I like her natural warmth and charm - you can almost feel the love that goes into her cooking. Here's what we had for the ten-course media tasting menu. To start with, some insanely delicious "krepek" (vegetable crackers, I think tapioca) that really dialed up the appetite. The amuse bouche changes daily. It's one of the ways Alicia and her team get to be creative with food, without changing the menu too often. The appetiser was a mixed platter of their signature Satè (charcoal-grilled meat on skewers). Each of these had their own individual dip designed to match the meats! Satè Padang Lidah Sapi (S$25 for five skewers) - buttery rich and tender Angus beef tongue sate done Padang style, served with warm beef broth sauce. 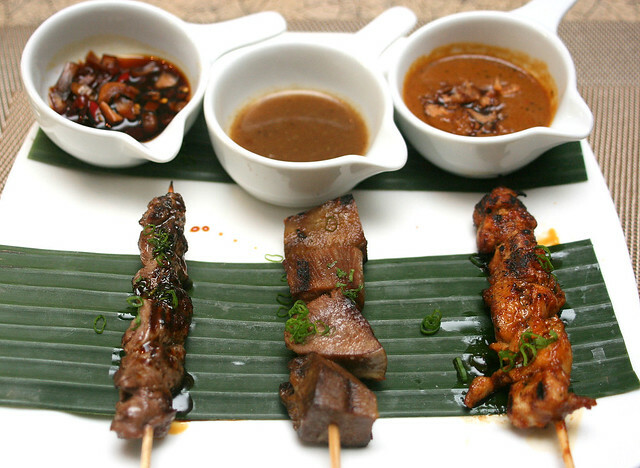 It's really tender and savoury - you might end up preferring this to the regular beef sate! If you have qualms about having bovine tongue action, get over them. It's worth it. Satè Ayam Madura (S$22 for five skewers) - an Eastern Java delicacy of grilled chicken tenders, served with creamy roasted peanut sauce (this is most like the satay sauce we know, but with a hint of lemongrass). There are several other Satè available. Veal breast, Angus short ribs with grated spiced coconut, lamb sausage, and Javanese grilled prawns. 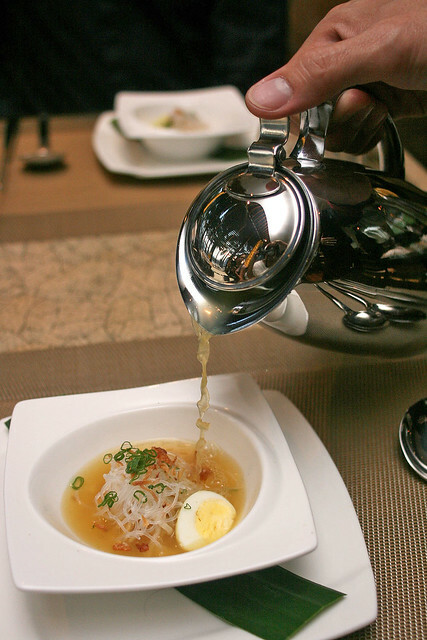 Soto Ayam Lamonggan (S$22 for full portion) - Indonesia's favourite chicken soup. This is the most dainty and delicate soto I have ever experienced. Maybe a little too light. 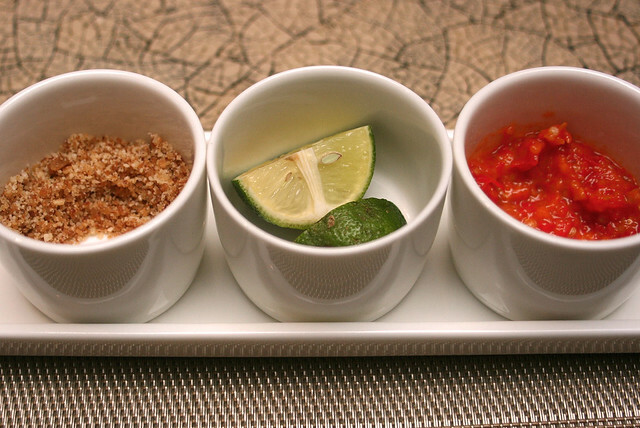 But fortunately along with the soto come condiments like fried onions, lime and pounded sambal chili. Customise the taste to your heart's content! I added everything and it really livened up the soup. And now we come to Mixed Entrees: these are obviously bite-size tasting portions. 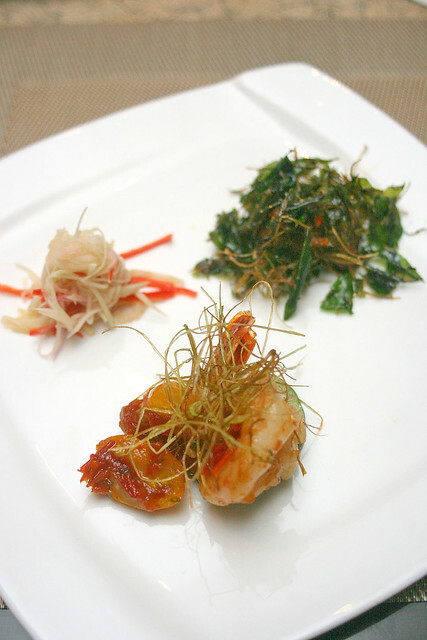 Udang Blado Padang, in foreground (full portion S$35): fried king prawn topped with an aromatic Western Sumatra sauteed chili sambal. Nice fresh prawn with chili. Ayam Tangkap Aceh with Selada Mangga (S$22 for full portion): that's the one on the upper right. It's deep-fried shrimp paste marinated chicken garnished with shredded and fried leaves (kaffir lime, curry, basil, lemongrass, etc). The Selada Mangga is a tangy green mango salad. Ikan Bakar Jimbaran (S$35 for full portion). This calls to mind the beachside seafood restaurants at Jimbaran Bay, Bali. 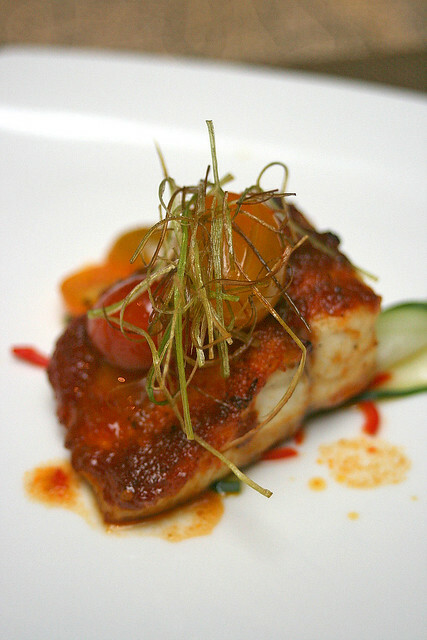 But this rendition of sweet and spicy grilled fish fillet is certainly a lot more refined than what you get there. 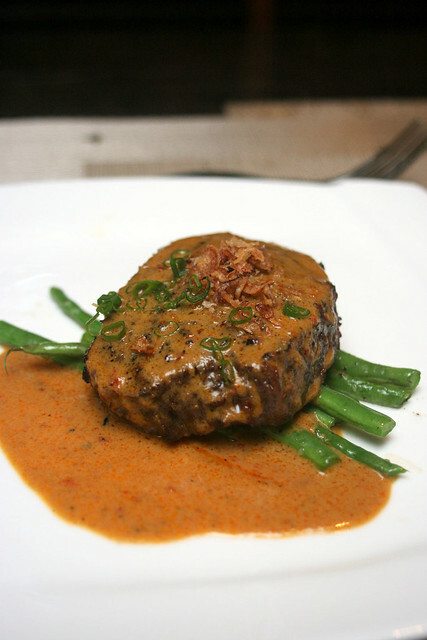 Angus Steak Rendang (S$35 for full portion): this is essentially a steak doused with rendang sauce. It is good meat, and the rendang flavours are there, but I am just not used to rendang that is "watery" in texture. 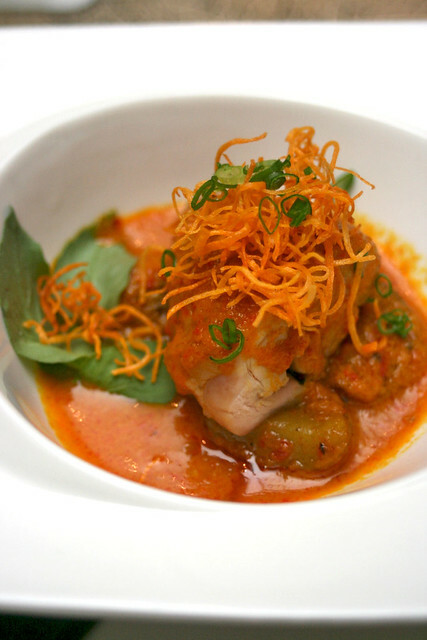 Confit Sakura Ayam Tuturaga (S$32 for full portion): this is a light, citrusy chicken curry from the North Sulawesi region. The chicken is cooked confit style, so it's supremely tender. I have to say the flavours for this one blew me away. Possibly my favourite dish of the entire evening. Tumpeng Nasi Kuning (left) and Nasi Moluccas (both S$6 each). We had rice on the side, as the dishes were just too good to be savoured alone. The "tumpeng" sounds similar to "topeng" or hat in Malay. The cone-shaped nasi tumpeng is a ceremonial rice used to celebrate important events, especially the "syukuran" or thanksgiving ceremony. This one here is basically turmeric rice. 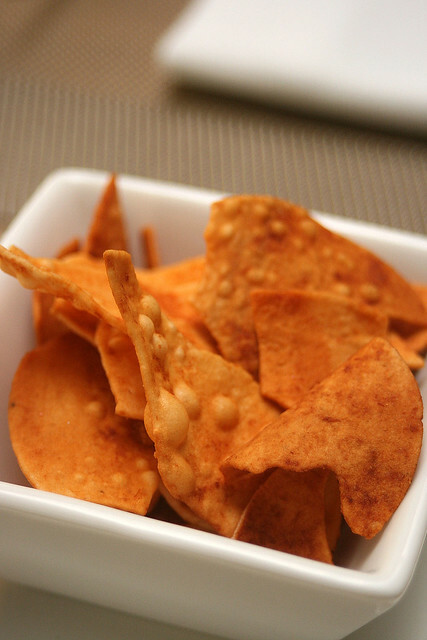 We loved the Nasi Moluccas, richly infused with spices and topped with these crispy shreds of dried beef. Delicious even on its own. 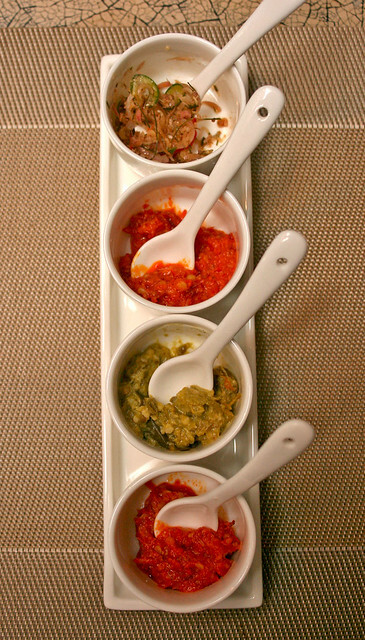 Several types of sambal chili and condiments are also served here. 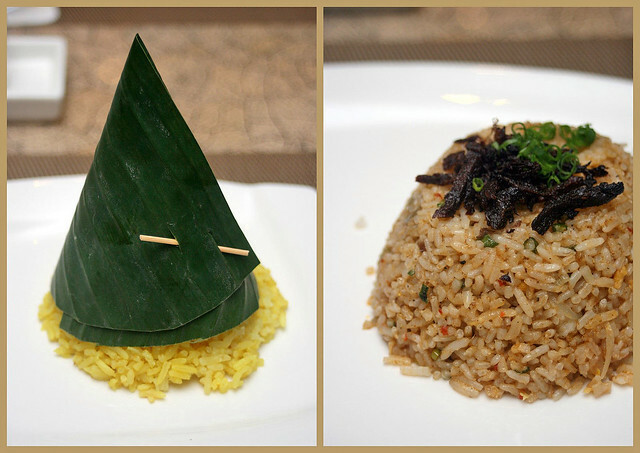 In Indonesia, these are common accompaniments to rice. Desserts here are only a handful, but they are divine! Sri Kaya creme brulee (S$19, extreme left) is a thick and creamy custard given a coconut and pandanas treatment. Very rich indeed. They make their own ice creams and sorbets here too (each scoop S$8). 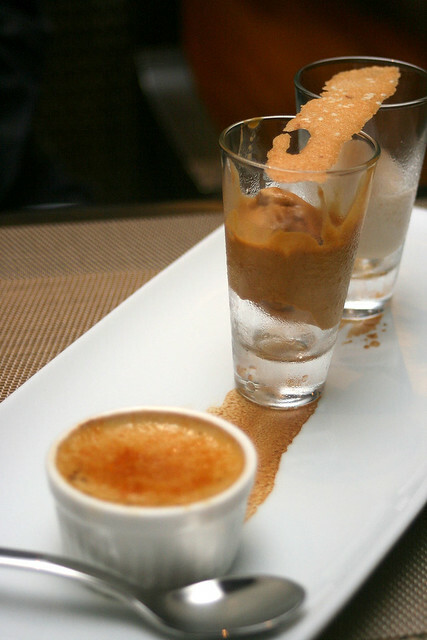 The gula melaka ice cream (middle) carries a bitter caramelisation aftertaste that helps cut through the sweetness. But above all, you must try the stupendous soursop sorbet. It's like all the fragrance of soursop chilled and distilled! 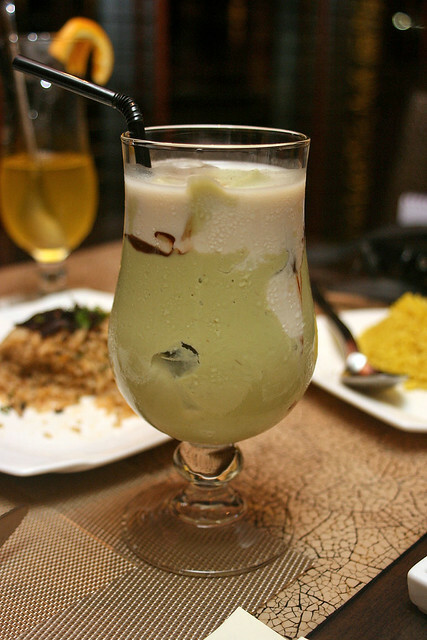 Es Alpokat - Avocado smoothie with chocolate. It's monounsaturated fats, so indulge! For lower calorie options, you can choose the lemongrass tea, or the cucumber drink (comes with long slivers of refreshing cucumber and tiny, diced chillies). Cocktails, mocktails, spirits and wines are also on the menu. 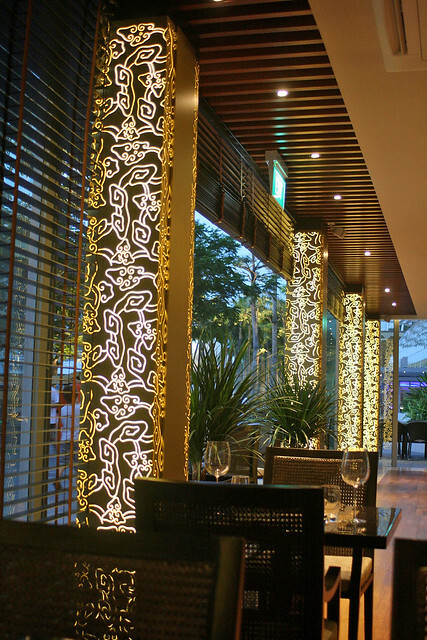 Towards the evenings, the columns light up with beautiful ethnic art. It lends the place a romantic look. There are little touches of thoughtfulness too. I love the bag hooks on the arms of the chairs, embossed with the restaurant logo. Service here, of course, is as fine as the food. Everyone is discreet, polite and reasonably knowledgeable about the dishes. There are a couple of set lunches available. 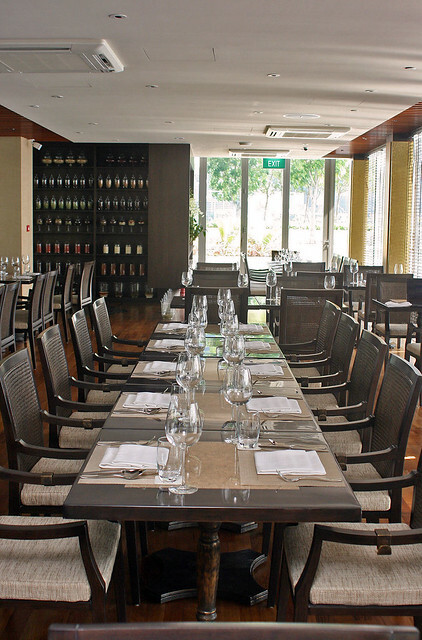 The Rijstafel set lunch (S$55) gives you six dishes plus dessert and coffee/tea. The Contemporary set lunch (S$45) lets you choose your own appetiser and main from signature items, also with dessert and coffee/tea. All prices are ++. You can check out the menu at their website too. Yes, Kenny, she is very sweet and motherly. Yeah, she could teach Ramsay a thing or two about zen and grace, haha. I'm a new fan of your blog and im glad to see this restaurant's review here. Unfortunately i felt that i have to get this out of my chest. our company had a dinner function at this restaurant sometime in july. everything went well, food was good, service was excellent, location and view was just simply breathtaking. but as i was going down to the washroom (the washroom was at the lower level), i passed by their kitchen just at the corner of the stairs, im not sure what that place was, mini kitchen or something, but i heard the cook or chef or whoever in there, was in a total fit; scolding, shouting, and the usage of the word F***, and its variations were not spared (think Gordon Ramsey's kitchen). i may not have visited many upscale dining places but that incident left a bad impression. anyway, keep up the good work. i enjoy reading your blog! Is there any washroom at the restaurant? When I came to the restaurant for dinner and would like to wash my hand before the meal and my kid need to use the toilet. But the service crew there usher us to go outside to use the toilet at marina bay sands mal. They told us that they don't have washroom. If they do have, why they didn't allow us the guests to use it? And they also didn't have kid chair. Is it one of those restaurant which not small-children-friendly? It's indeed gave us a bad impression. Anonymous2: ohhh, so it's a normal kitchen after all! LOL! Thanks for sharing! Anonymous3: I had to use the mall washroom too...I don't think any of the waterfront dining outlets have any toilet facilities. I didn't know about baby chairs, but maybe that's a good point to raise to the restaurant. Yea, It's a standard for MBS restaurants not to have a washroom in there. Personally, I think it's more hygienic. I don't want the people handling my food to be washing the loos, do you?